Where is everybody? Or rather, where WAS everybody in the Iron Age, at Chavella hillfort? Because they certainly don’t seem to have been living where we thought they were! 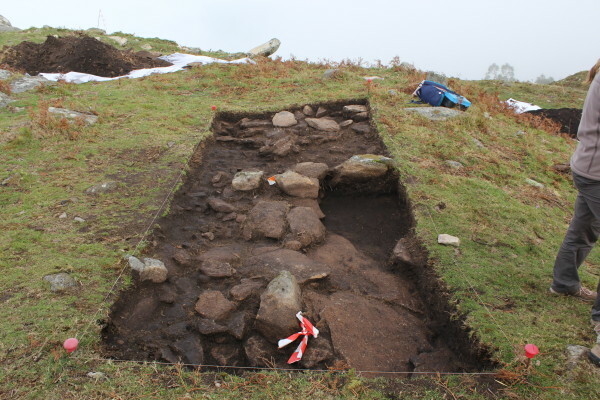 All good things come to an end, and our fabulous dig at Chavella hillfort is no exception. As we bounced up the hill for our last day of fieldwork, we were already beginning to ponder what we’d found. This had been the first ever week of excavation at Chavella, and we’ve opened two trenches – one on the acropolis and one on the eastern terrace. Almost as soon as we began stripping the topsoil, we started finding huge blocks of rock, seemingly arranged like collapsed stone walls. In neither case did they simply seem to be the collapse from the ramparts surrounding each area. Instead, they seemed to be separate structures. The one on the acropolis even had a rough stone floor. Were these the cabañas – circular domestic buildings – that typically crowd the terraces of Spanish hillforts? By the end of the week, we were questioning our earlier interpretation. Although we had found a pair of hammer and polishing stones, and three tiny pieces of Iron Age pottery, it was nowhere near the amount of material culture expected for cabañas. 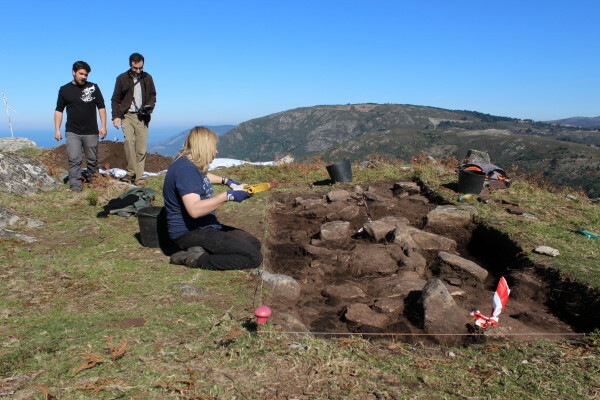 Where were the ceramics, tools, decorative objects and gaming pieces that had been found nearby at Cabeciña – the other hillfort excavated in August as part of the Costa dos Castros project? 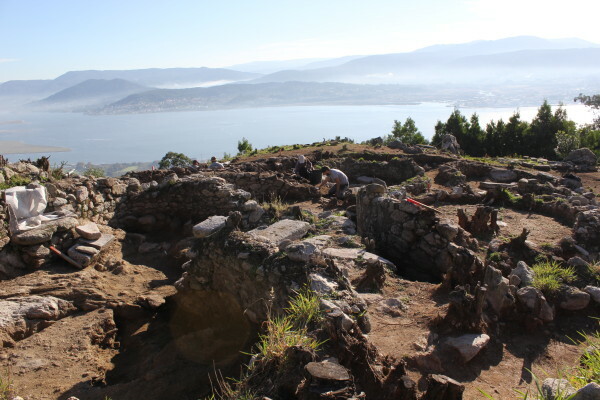 View of current excavations at Santa Trega looking out over the River Minho. The terraces are crowded with scores of circular buildings, known as Cabañas. At Santa Trega the archaeologists have been finding around 500-600 sherds of pottery per day; these poor guys are going to be pot-washing for the rest of their lives! And, other comparable hillforts in the area (including Cabeciña) are also rich in finds. So why is Chavella so clean? Starting with the acropolis trench, the only finds so far have been the pair of hammer and polishing stones found by Maggie. Site director Carlos Otero Vilariño explained that the absence of finds actually supports the hypothesis that this area had been re-used during the medieval period. Carlos stands on the edge of trench one as he reassesses the collapsed stone structures inside. According to Carlos, this lack of artefacts is more usual for the Medieval than the Iron Age, so it’s a result in terms of the research, given that the trench was located expressly to confirm whether or not there was re-use during this period. Maggie cleans up trench one ahead of the final photo. We have no further evidence in the trench that says anything about dates, and no clearly defined features beyond one line of stones adjacent to the bedrock and some cobbles that were clearly meant to fill the gaps around the bedrock to level the surface. Trench one is full of huge stones, and what seems to be rough flooring, or filling to create a level surface, at the far end. Carlos and Marta will be extending this trench next week (towards the south-west) to chase the wall, however, so we may end up with more information. Marta and Carlos excavate trench two. There are more collapsed stone walls in here, and a few tiny bits of Iron Age pottery. Down in the second trench inside the ramparts, the situation is similarly unresolved. 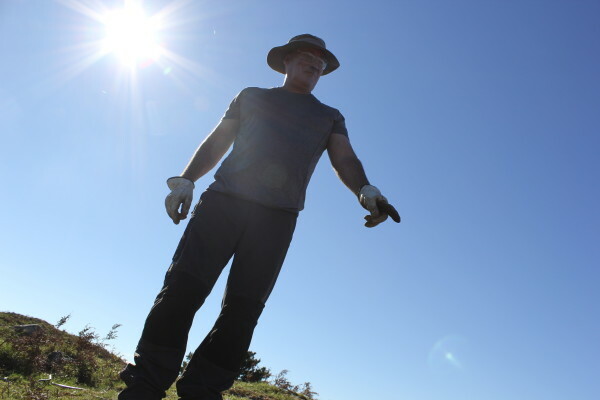 Carlos placed this trench hoping to drop down onto the cabañas – the typical circular dwellings that are found in such abundance at Santa Trega, and even at nearby Cabeciña in August. Maggie tries to work out what’s going on in trench two. You can see the massive ramparts behind her. There’s plenty of stone, but it appears to be from two phases of collapse rather than the remains of an intact structure. Again, the finds have been strikingly sparse, with just three tiny sherds of Iron Age pottery for our efforts. Chavella hillfort is used by local parachutists as a launching point, and they’ve told our team that almost nothing has been found in terms of surface finds over the years, which for this area of the hillfort is again quite unexpected. So what can we really conclude? Spanish hillforts do seem to have different functions depending on their location. The ones on higher ground tend to be more militaristic, while the ones on lower ground are often more densely populated. 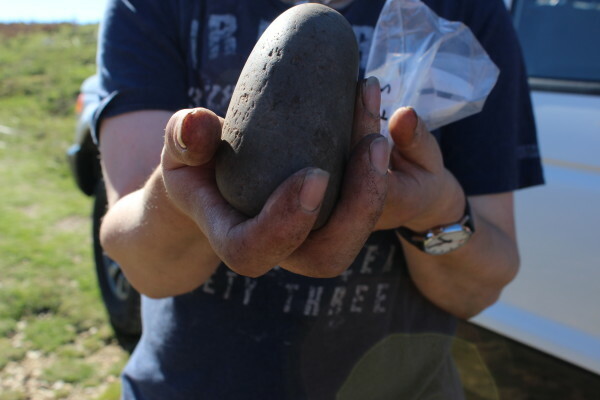 The hammerstone found in trench one up on the acropolis of Chavella hillfort. So why haven’t we found the same material evidence at Chavella as at Cabeciña? Perhaps we haven’t dug far enough down yet. Perhaps this hillfort was built for a different purpose to the likes of Cabeciña and Santa Trega. Or perhaps we just haven’t dug in the right spot yet. This is a very real possibility, as there is another area of terracing on the south-west corner of the site, which has a much more strategic view of the coast and is better protected from the wind. If people were living at Chavella, then that’s where the evidence would be and for Carlos, that’s the next step of investigation. The thing is, it’s going to take a JCB, a bigger team and at least a month of digging to figure it all out… sounds like next season is sorted! Some of the excavation team standing by trench one on the last day of excavation. We hope you’ll join us next year! 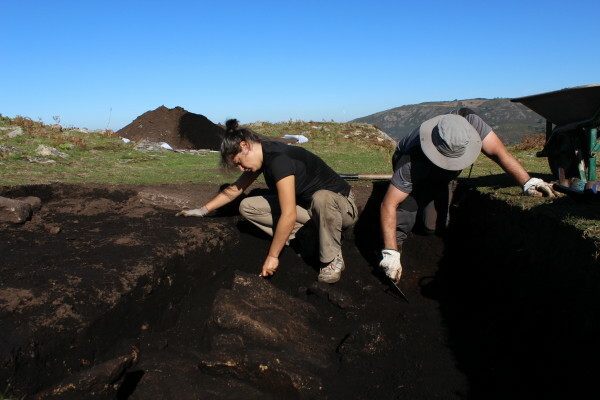 Archaeologists working on Iron Age hillforts in Galicia are starting to question when the process of hillfort urbanisation in the area really began. 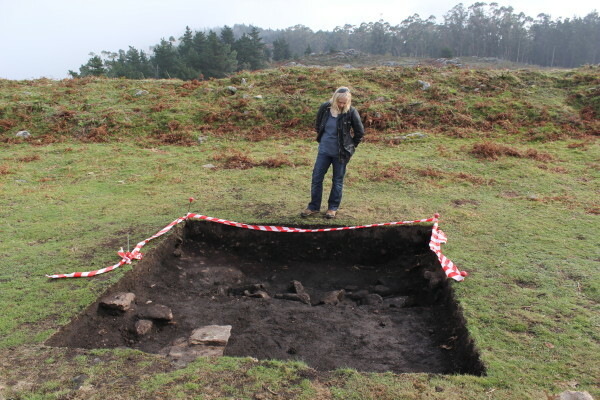 Up until now, most people had assumed that the Romans were the catalyst, rather than the Iron Age Galicians themselves – but some of the evidence that’s turning up on these sites is presenting a challenge to those assumptions. 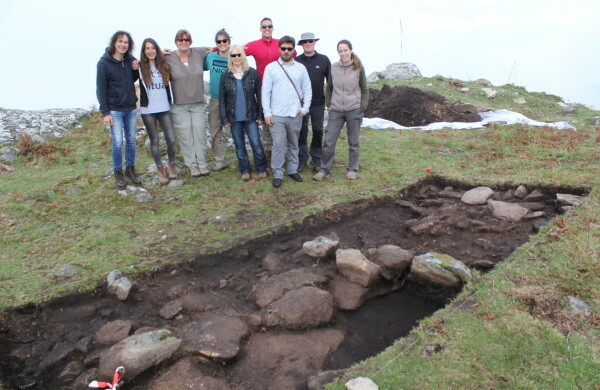 We can’t wait to come back next year to continue excavations at Costa dos Castros to find more evidence of how Iron Age Atlantic hillfort culture developed in Galicia, and how the different sites along this stunning stretch of coast relate to each other. We’ve made a small start on uncovering Chavella’s history, and we’ve got our fingers crossed for the 2016 season. We hope you’ll join us!